"Finding time to get everyone together to reconnect, relax, enjoy and celebrate life's special moments can be a challenge," said Jeanne Dailey. "We're hopeful that our 'Celebration Vacation' makes planning your next celebration a little easier." Life is punctuated by special moments worthy of a celebration. Whether it's a milestone birthday, anniversary, graduation, or reunion of family or friends, Newman-Dailey Resort Properties is ready to make it spectacular with the "Celebration Vacation" package, featuring vacation rentals along the sugar white sand beaches of South Walton and Destin, Fla.
"We've always had guests come and stay with us at our Destin Resorts and vacation rentals for special occasions," said Jeanne Dailey, owner Newman-Dailey Resort Properties. "Now we've found a way to make it even more memorable while saving our guests time by bringing together all the elements of a great celebration-- an outstanding location, great food and priceless photographs of memories that will last a lifetime." With the Celebration Vacation package, those charged with organizing the big event can begin by selecting the perfect vacation rental online or by calling one of the Newman-Dailey vacation specialists. From well-appointed homes and comfortable condos to cozy townhomes and villas, Newman-Dailey's vast array of beach vacation rentals sleep groups from six to 16. "We just like the properties," said Paul Stultz, a 20-year Newman-Dailey guest. " We've stayed at 10 or 12 different Destin vacation rentals over the years and celebrated many special occasions. Kerbi and the team are always really helpful, especially if you need something out of the ordinary." No celebration is complete without the feast and Newman-Dailey has teamed up with Table Five to create a celebratory meal in the most relaxed of settings --the vacation home or condo. With a love for freshness and made from scratch dishes, Chef Phillip McDonald believes a dish is best when using top quality ingredients and seasonal produce. Groups have a choice of one of three of Table Five's custom three-course, family-style menus, ranging from the "Coastal Southern" shrimp and grits to the "If by Land" menu featuring garlic crusted pork tenderloin. The commemorative dining event is topped off with a delectable dessert as well as a special festive dessert for the guest(s) of honor. To capture the special memories, Newman-Dailey has partnered with Steve Wells Photography, for a special one-hour photography session. The session can be held on the beach or at the vacation rental and the group will receive one DVD with all the images. "We know that everyone is busy and finding time to get everyone together to reconnect, relax, enjoy and celebrate life's special moments can be a challenge," said Dailey. "We're hopeful that our 'Celebration Vacation' makes planning your next celebration a little easier." 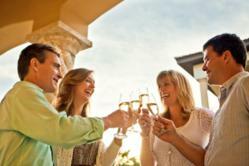 Rates for the "Celebration Vacation" package vary, depending on party size and number of nights. For more information call 1-800-225-7652 or visit http://www.DestinVacation.com.